SPOILERS: DON’T READ THIS UNTIL YOU’VE SEEN THIS WONDERFUL FILM. This is an extraordinary film; the bulk of it is the coming of age story of the asthmatic Moncho (a performance by Manuel Lozano to rival Ana Torrent in Spirit of the Beehive) and then, in the final 10 minutes, the Civil War starts. The beautifully presented scenes of a young boy growing up end abruptly; I can’t recall another film that suddenly, and unflinchingly, switches tone so precipitously at the climax. It is an immensely powerful transition, portraying the horrendous nature of Civil War and fascism. Fernando Fernán Gómez, who plays the teacher who mentors Moncho, played the father in Beehive and so links the films. His performance, like those of all the principals, is brilliant; he sensitively conveys the feelings of a teacher at the end of his career who loves introducing children to the vagaries of life. New German Cinema dealt with W.Germany coming to terms with its Nazi past; Spanish cinema is coming to terms with the country’s fascist history. Why is it that the stories about apartheid we get to see, in the UK at least, are the white man’s story? The economic racism of the film industry, of course, explains this but it does make watching films like Goodbye Bafana a slightly uncomfortable experience. The proper story is of the ANC’s struggle and this can be readily told via the character of Mandela; here we only get tantalising references to the fight against the racist regime. Mandela’s own story has been in development for years but it looks like it will get told now Clint Eastwood is attached; however, according to the internet movie database, this will focus on the post-apartheid years! 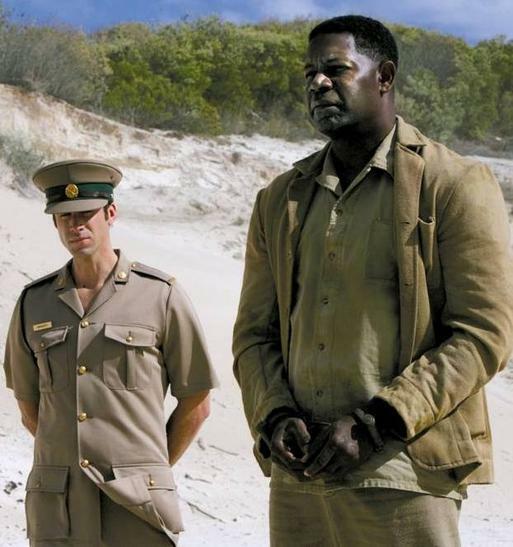 Haysbert is terrific as Mandela; how do you play a saint? Of course, no-one is a saint and Mandela, according to my partner, was far more bolshie than he’s shown here. Joseph Fiennes, an actor I’ve never warmed to, is also terrific but I’m not interested in how he regains his humanity (the film is based on the prison guard’s book whose authenticity has been doubted). A film to see because we get an inkling about the realities of apartheid. But we don’t get to hear how, for many years, western governments supported the S.African government, or how many politicians dubbed the ANC terrorists. Does anyone know of a film that does this? This film, about the final months of IRA-man Bobby Sands’ life, had to be harrowing otherwise it wouldn’t be doing its ‘duty’. It was. As Sands starves to death, the body horror of actor Michael Fassbender’s deterioration make difficult viewing and it’s a relief when he dies. The justification for his hunger strike (to gain political prisoner status from the Thatcher government) is discussed in an extremely long take (see image). There are other ‘avant garde’ devices: such as the banal actions of mopping up of urine after a ‘dirty protest’; the ‘birds flying’ metaphor as Sands’ life slips away; the extreme close up on Sands’ body as he dies. This we might expect from a Turner Prize-winning artist (he’s not going to do a ‘straight’ movie is he?) and it’s invigorating to watch such challenging film: not just the body horror, there are also long scenes with no dialogue. It’s a film that demands thought. What under-40s would make of the opening half hour or so I’m not sure. I can remember how Sands’ (and others’) protest dominated the news. This film gives virtually no social context, except for extracts from the execrable Thatcher’s speeches of the time. Will it be read as a philosophical film about the human need for freedom rather than being about disastrous British intervention in Northern Ireland? This was the penultimate film from Clooney and Soderbergh’s Section Eight company, their attempt to make interesting movies funded by the commercial success of the Oceans series. 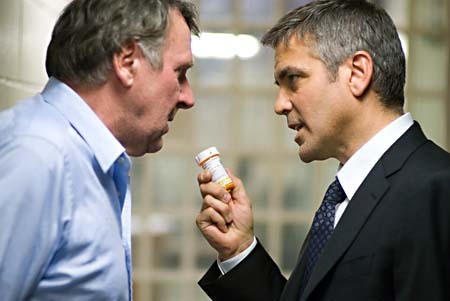 Good effort guys: Far From Heaven (2002), Syriana, Goodnight, and Good Luck (both 2005), A Scanner Darkly (2006) and Michael Clayton are a worthy legacy. While not exactly a political thriller (like Syriana) it has much in common with ’70s conspiracy thrillers such as The Parallax View (1974) though the resolution of Clayton is different. In a way is depressing that we can see American films about corporate malfeasance 30-years on suggesting that nothing has changed despite the best efforts of liberal political thrillers; Three Days of the Condor (1975), with its focus on the realpolitik of oil, is just as topical now. However, it’s important these films are made otherwise American cinema, at least, would rarely if ever hold up a critical mirror to its nation. Writer-director Michel Gondry will always be a ‘must-see’ for me after Eternal Sunshine of the Spotless Mind (2004); I love the quirky way he views the world. 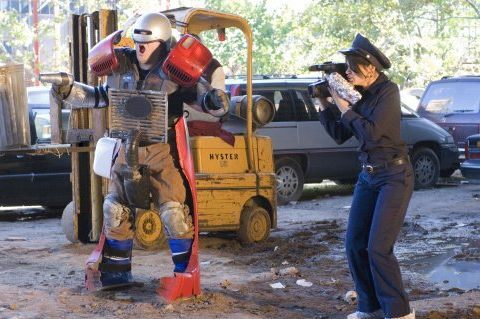 Be Kind Rewind had a platform release in North America and grossed around $11m. It was released wide, before this, in the UK and took over £3.5m. Given the rough estimate that films in N.America take, on average, 10 times as much as in the UK, it’s clear that Gondry’s quirky sensibility plays much better here. There are plenty of ‘names’ (Black-Gibson-Def) to sell the film even though it remains an indie production from New Line (owned by Time Warner). Be Kind Rewind is both ‘anti’ and ‘pro’ Hollywood; it satirises the major studio’s punitive approach to piracy (the always-great-to-see-Sigourney Weaver cameos as their lawyer) but acknowledges the ‘dreams’ produced by Hollywood are important through the characters’ own film about Fats Waller (who never in fact lived in the video store): ‘print the legend’. The resolutely low-fi approach of the film-makers, video not digital, and do-it-yourself special effects, also fondly pokes fun at Hollywood and results in some tremendous visuals; the cut-out motor cars are terrific (and the camouflage joke is inspired). Age is often represented as a joke and laughing about a difficult situation is a good way of dealing with it. However, many old people are not in difficult situations and they are also greatly under-represented in film. Thus Venus would be welcome simply because two of its central characters are old: O’Toole is in his 70s and Philips is in his 80s. Both characters are in difficult situations as they struggle to manage alone, and their lonely, lives and this – along with the young, proletariat-Northerner (Jodie Whittaker) – creates the drama. The casting is terrific: both men were stars in the 1960s: O’Toole as the handsome leading man and Philips the lothario in British comedy; not forgetting Vanessa Redgrave – as O’Toole’s wife – who was the gamine lead of Blowup (1966). They carry their personas with them giving a sense of their pasts so we can understand what they were and how frustrating it must be to be what they have become. I haven’t seen sriptwirter Hanif Kureishi-director Roger Michell’s The Mother (2003) which is similarly unconventional in dealing with an old-young relationship but I shall have to catch it. I didn’t have high hopes for this so was pleased to see this episode of Bond at least referencing the realpolitik. While it’s usual for action cinema to have a patina of contemporary reference, it seems here to be more than just topical. There’s only one American character, Felix, who’s vaguely sympathetic so it will be interesting to see how it plays in America. There’s plenty of references to torture (that’s the British), American interference in the politics of South America and the fact that oil and water are the vital resources of now and the future. There’s a reference to the golden body killing in Goldfinger (1964), this time the naked woman on the bed is covered in oil. Craig’s wasted in the role (the trailered Defiance in with him looks interesting) but he runs and snarls with panache. I liked the humour, a Bolivian taxi driver insists on telling them why he became a driver, and the climax is suitably pyrotechnic. The best scene, however, is the Tosca set piece. The magnificent music is foregrounded, the set design is terrific and the narrative ruse is clever. The opera audience is a perfect metaphor for the bourgeoisie that control power.